"Glutamic acid (abbreviated as Glu or E) is one of the 20-22 proteinogenic amino acids, and its codons are GAA and GAG. It is a non-essential amino acid. The carboxylate anions and salts of glutamic acid are known as glutamates. In neuroscience, glutamate is an important neurotransmitter that plays a key role in long-term potentiation and is important for learning and retaining memory. Wikipedia said this about Glutamate and therefore, indirectly, about Excitation . Sponges do not have a nervous system, but also make use of glutamate for cell-to-cell signalling. Sponges possess metabotropic glutamate receptors, and application of glutamate to a sponge can trigger a whole-body response that sponges use to rid themselves of contaminants." "N-Methyl-D-aspartic acid or N-Methyl-D-aspartate (NMDA) is an amino acid derivative that acts as a specific agonist at the NMDA receptor mimicking the action of glutamate, the neurotransmitter which normally acts at that receptor. Unlike glutamate, NMDA only binds to and regulates the NMDA receptor and has no effect on other glutamate receptors (such as those for AMPA and kainate). NMDA receptors are particularly important when they become overactive during withdrawal from alcohol as this causes symptoms such as agitation and, sometimes, epileptiform seizures. "AMPA (α-Amino-3-hydroxy-5-methyl-4-isoxazolepropionic acid) is a compound that is a specific agonist for the AMPA receptor, where it mimics the effects of the neurotransmitter glutamate. There are several types of glutamatergic ion channels in the central nervous system including AMPA, kainic acid and N-methyl-D-aspartic acid (NMDA) channels. In the synapse, these receptors serve very different purposes. AMPA can be used experimentally to distinguish the activity of one receptor from the other in order to understand their differing functions. AMPA generates fast excitatory postsynaptic potentials (EPSP). AMPA activates AMPA receptors that are non-selective cationic channels allowing the passage of Na+ and K+ and therefore have an equilibrium potential near 0 mV. "Kainic acid (kainate) is a natural marine acid present in some seaweed. Kainic acid is a potent neuroexcitatory amino acid that acts by activating glutamate, the principal excitatory neurotransmitter in the central nervous system. Glutamate is produced by the cell’s metabolic processes and there are four major classifications of glutamate receptors: NMDA receptors, AMPA receptors, kainite receptors, and the metabotropic glutamate receptors. Kainic acid is an agonist for kainate receptors, a type of ionotropic glutamate receptor. Kainate receptors likely control a sodium channel that produces EPSPs when glutamate binds." Glutamate receptors in the nucleus accumbens shell control feeding behavior via the lateral hypothalamus. "The nucleus accumbens in a brain region considered to be important in the regulation of appetitive behavior and reinforcement. The accumbens receives afferent input from corticolimbic and thalamic structures, which is primarily coded by excitatory amino acids (EAAs). The present studies investigated the role of EAA input to the nucleus accumbens in feeding behavior in rats, in two recently characterized subregions of the accumbens, the "core" and "shell". In the first series of experiments, it was shown that blockade of alpha-amino-3-hydroxy-5-methylisoxazole-4-propionic acid (AMPA) and kainate glutamate receptors in the medial part of the accumbens, corresponding to the medial shell subregion, resulted in a pronounced feeding response. Bilateral microinfusion of 6,7-dinitroquinoxaline-2,3-dione (DNQX, 0.25-0.75 micrograms/0.5 microliters), 6-cyano-7-nitroquinoxaline (CNQX, 0.75-1.5 micrograms), and 2,3-dihydroxy-6-nitro-7-sulfamoylbenzo-(F) quinoxaline (NBQX, 0.2-1.0 micrograms) markedly stimulated food intake immediately following infusion, in a dose-dependent manner. Infusion of DNQX into the central accumbens region, corresponding to the core, did not elicit feeding. Infusion of the NMDA antagonists 2-amino-5-phosphonopentanoic acid (AP-5) and MK-801 (dizocilpine maleate) did not elicit feeding in either region. The feeding response to DNQX was blocked by local coinfusion of AMPA. Systemic pretreatment with naltrexone (5 mg/kg) had no effect on the DNQX-feeding response; however, prior systemic administration of both D-1 and D-2 antagonists reduced the response by half, suggesting a modulatory role for dopamine in the response. Moreover, the feeding response was completely inhibited by concurrent infusion of the GABAA agonist muscimol (10, 25 ng) into the lateral hypothalamus, a major projection area of the accumbens shell. These findings demonstrate a selective role for non-NMDA receptors in the nucleus accumbens shell in ingestive behavior, and suggest an important functional link between two major brain regions involved in reward, the nucleus accumbens and lateral hypothalamus. " Role of glutamate receptors in the nucleus accumbens on behavioural responses to novel conflictive and non-conflictive environments in the rat. "The possible role of glutamic acid locally applied into the nucleus accumbens on exploratory behaviours measured in 'conflictive' and 'non-conflictive' environments was studied in adult male rats. As a model of conflictive environment, the elevated asymmetric-plus maze (APM) was used. As a model of a non-conflictive environment, a modified holeboard enriched with an object (OVM) was used. CNQX (antagonists of kainate/AMPA glutamic acid receptor). in the 'Two High Walls' arm, glutamic acid decreased permanency. In the OVM, no major changes in the motor activity were observed with glutamic acid. Nevertheless, the vertical activity (an index of rearing) and head-dipping were inhibited by the amino-acid treatment. In the APM, the decrease of exploration induced by glutamic acid was blocked by all three receptor antagonists. In the non-exploratory behaviours, the facilitatory effect observed in the 'High and Low walls' arm was blocked only by AP7 and CNQX. The inhibitory action of glutamic acid on the permanency score in the 'Two High Walls' arm was not blocked by the receptors antagonists. In the OVM, AP7 and CNQX were effective in blocking the inhibition of glutamic acid on the vertical activity, but in head-dipping, only AP3 and CNQX were able to block the effect of the amino acid on this behaviour. In conclusion, the present results are compatible with the concept that glutamatergic input fibres to the nucleus accumbens modulate the expression of exploratory behaviour induced by novelty in conflictive and non-conflictive conditions." I found this very difficult to understand. "The nucleus accumbens (NAc) has been described as a crucial convergence point for information about environmental contexts and cues before the selection and execution of a final motor output and has long been known to be important in the processing of reward-related behaviors (Cardinal et al., 2002; Carelli, 2002), specifically in the context of cocaine-induced plasticity (Thomas et al., 2001; Boudreau and Wolf, 2005). What happens at this last stop? Three of the most robust glutamatergic inputs to the NAc are the basolateral amygdala (Amyg), medial prefrontal cortex (PFC), and the ventral hippocampus (vHipp), each probed by Britt et al. 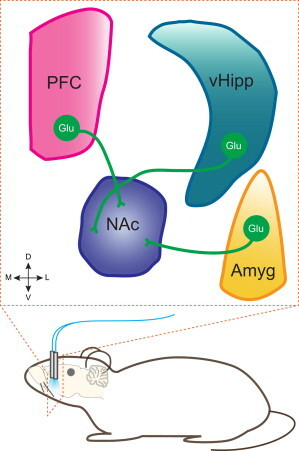 (2012) using optogenetic methods (Figure 1). This characterization revealed many novel insights: while Britt et al. (2012) confirmed some assumptions about these limbic systems, they challenged the dogma surrounding NAc information integration." Synaptic and behavioral profile of multiple glutamatergic inputs to the nucleus accumbens. "Excitatory afferents to the nucleus accumbens (NAc) are thought to facilitate reward seeking by encoding reward-associated cues. Selective activation of different glutamatergic inputs to the NAc can produce divergent physiological and behavioral responses, but mechanistic explanations for these pathway-specific effects are lacking. Here, we compared the innervation patterns and synaptic properties of ventral hippocampus, basolateral amygdala, and prefrontal cortex input to the NAc. Ventral hippocampal input was found to be uniquely localized to the medial NAc shell, where it was predominant and selectively potentiated after cocaine exposure. In vivo, bidirectional optogenetic manipulations of this pathway attenuated and enhanced cocaine-induced locomotion. Challenging the idea that any of these inputs encode motivationally neutral information, activation of each discrete pathway reinforced instrumental behaviors. Finally, direct optical activation of medium spiny neurons proved to be capable of supporting self-stimulation, demonstrating that behavioral reinforcement is an explicit consequence of strong excitatory drive to the NAc."